We are racing towards the end of the year and would like to remind you to make use of your medical aid benefits before 2019. If you have not yet had your annual eye exam, book your appointment as soon as possible. October has several Health Awareness Days, but we would like to focus on World Sight Day on the 11th of October and World Stroke day on the 29th of October. Did you know that up to 360 South Africans a day are affected by strokes? A stroke is a medical emergency and is essentially a ‘brain attack’. The supply of blood and oxygen to the brain can be cut off because of a blockage or damage to a blood vessel in the brain. This causes the brain cells to die, which can be fatal or result in disability. When a stroke is caused by blockage, medication can dissolve the blood clot causing the obstruction, or a tiny instrument, guided through the system of arteries, can extract the clot. If the stroke is caused by a bleed, the damaged artery can be surgically repaired or reinforced to stop bleeding. In some cases, sustained physiotherapy and occupational therapy can help reduce disability caused by damage to the brain. 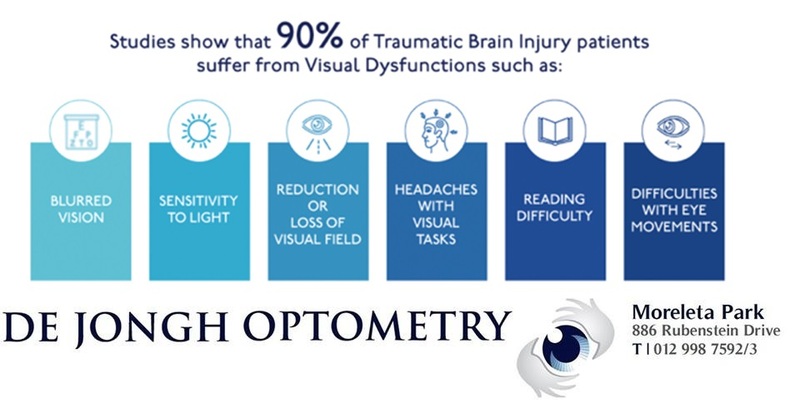 Visual problems are often overlooked during initial treatment of a brain injury and in some cases symptoms may not be present until sometime following the injury. If you notice any changes in your vision following a concussion or some other head trauma, don’t ignore them – immediately contact us for a neuro vision assessment. It is important to determine the cause of the vision change. Left untreated, visual system disorders can have serious consequences, such as the ability to organize and make sense of visual information along with poor depth perception and difficulties concerning balance and posture. Driving is the most risky activity to perform with a disrupted visual system. De Jongh Optometry together with Eyemind Neuro Vision Rehab can diagnose and provide treatment for visual disorders following a traumatic brain injury such as stroke. Nearly 75% of the world’s blind population are avoidably so. Avoidable blindness is defined as blindness which could be either treated or prevented by known, cost-effective means. Diabetes mellitus is becoming a global epidemic and is now one of the top causes of vision loss globally. In 2014, there were approximately 422 million people with diabetes compared to 108 million in 1980. Increased urbanization, consumption of less nutritious food, more sedentary lifestyles and resulting obesity have all contributed to the dramatic rise in the global prevalence of diabetes, particularly in resource poor countries. Glaucoma is the name given to a group of related diseases where the optic nerve is being damaged by elevated pressure in the eye. The nerve fibers progressively die, taking away the peripheral or side vision first. Central vision usually stays intact until the very late stages of the disease. Therefore visual loss goes undetected until it is quite advanced. With timely treatment and good education, people with glaucoma can retain excellent vision their entire life. Sunglasses are a great fashion accessory, but their most important job is to protect your eyes from the sun’s ultraviolet (UV) rays. Some of the sun’s effects on the eyes include cataracts. An estimated 20% of cataract cases are caused by extended UV exposure. 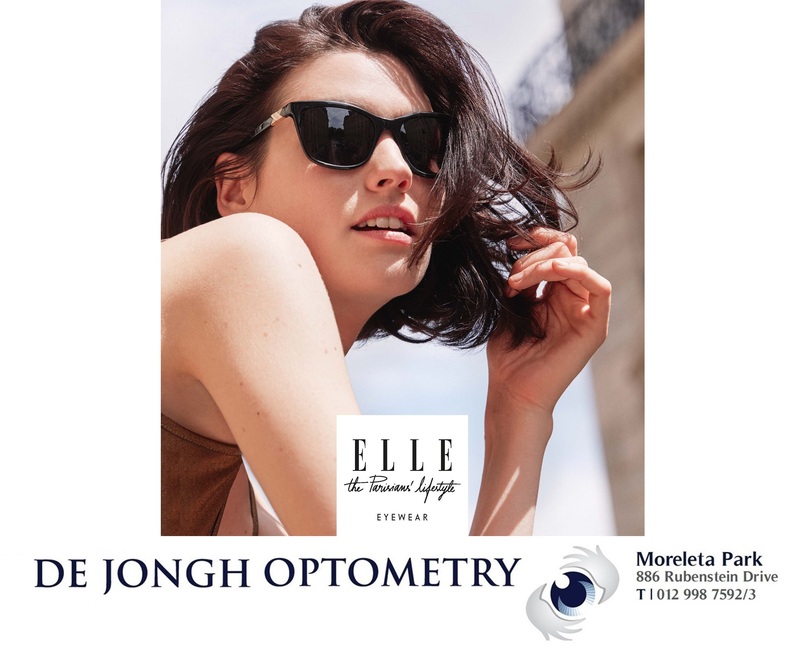 Keep your eyes protected this summer and visit us to try on a few of our new Elle sunglasses. We also stock Maui Jim, Invu, Oakley and Adidas. We have a selection of sunnies on special for R500 and less. Visit our practice at 886 Rubenstein Drive, Moreleta Park, Pretoria.